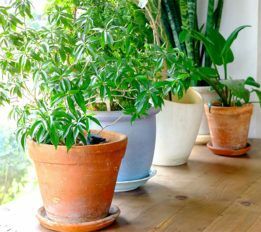 If your houseplants have spent spring and summer outdoors, now is the time to start the process of bringing them indoors. Tropical houseplants placed around your home during winter months can turn even the darkest days of the year lush and green. Houseplants adapt to the outdoors quickly and easily as long as their sun and water needs are met. The key element to transitioning plants is timing. There aren’t specific rules per-se, but there are helpful guidelines to give you reassurance the transition will be a success. Most common houseplants can survive outside until early October, but there are always exceptions, so research your plant varieties to determine their specific needs. To be safe, the beginning of the school year serves as a good reminder to start planning your transition. There are a couple of advantages to winterizing plants earlier. You can do so at a more leisurely pace if you begin taking plants inside earlier in the season. This allows for a more gradual transition, giving plants time to adjust to the indoor lighting and dryer conditions. Whatever timeline works best for you, keep in mind that temperatures of 50°F or less can harm tropical plants. When preparing to transition your houseplants inside, you can help them adjust by placing them in the shade for a couple of weeks before taking them indoors. That way, they can get used to receiving fewer hours of sunlight during the winter. Plants can also be cut back slightly so their size is more manageable and new growth is acclimated to the indoors. To rid plants of pests before transitioning indoors, treat them outdoors with Bonide Systemic Houseplant Insect Control Granules and Bonide Eight Insect Control or Bonide Systemic Houseplant Insect Control Granules and Bonide Organic All Seasons Horticultural Spray Oil. Be sure to spray the underside of leaves to dislodge pests that hide there. In spring, when frost is a thing of the past and nightly temperatures have risen above 50°F, it’s safe to reintroduce your houseplants outdoors. Inside environments present their own challenges and quirks. As daylight decreases, plant growth slows and some plants will go dormant. Stop fertilizing until days become longer at the end of winter. While plants are protected from the elements and lower maintenance indoors, they still need attention. Houseplants require water based on their individual needs. Keep in mind, the most common cause of death is overwatering, so be cautious not to kill your plant with kindness. To evaluate dryness, touch the top inch or so of the soil. If possible, feel the weight of the pot when dry so you’ll have a reference in the future. Most houseplants only need to be watered once per week or less, depending on the variety. If you still aren’t sure, stop in to speak to one of our knowledgeable associates. Adjust your watering schedule if you observe changes such as browning of the outer leaves edges, which may mean your houseplants aren’t getting enough water. If your plants’ innermost leaves turn yellow it might be overwatered. It can be hard to tell the difference, so don’t hesitate to ask an expert for help. In addition to watering, houseplants also require humidity during winter. Artificially heated indoor environments become quite dry for houseplants. If you don’t have a humidifier, hydrate plants by misting them with a spray bottle. You can also create a humidity to add moisture to the air. Put pebbles on a tray then fill with water, leaving the tops of the pebbles exposed. Place a houseplant on the tray and it will absorb liquid in the air as the water evaporates. Indoor houseplants aren’t always exposed to enough sunlight. Research plants to determine how much sun they require. Those that need to soak up the most rays should be placed next to south-facing windows. Plants that flourish in the shade do best near east or west windows. If plants can’t receive four to five hours of light per day in your home, artificial light sources, such as grow lamps, can provide supplemental light. With proper care you can enjoy your plants all year long, and they will love their seasonal settings and the occasional change of scenery!